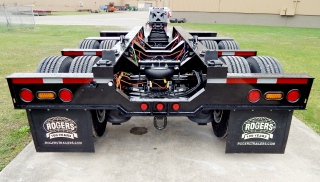 The ULTIMA Series 65-ton drop side deck trailer was designed and manufactured to excel in the most demanding of applications. The easy to operate NoFoot gooseneck is equipped with our optional heavy-duty lift package, which includes 10" bore hydraulic cylinders and severe-duty lift components throughout. The drop side deck (raised center) is 9'-0" wide and 27'-0" long and provides one of the lowest deck heights available at 15" loaded. 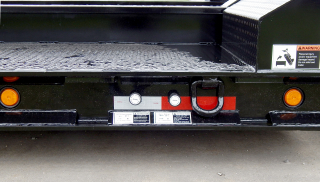 Trap door extension blocks to adjust 5th wheel height from 51" to 55"
The sloped front approach assists in the loading & unloading of machinery to the drop side deck. 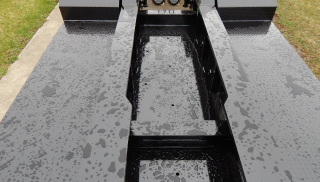 Vertical gussets on the front slope as well as top and bottom side beam flange reinforcing make the side beams more durable for the wear and tear caused by wide machinery. 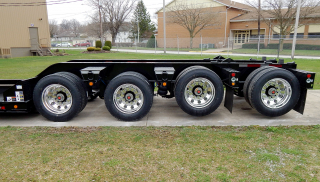 The 9'-0" wide drop side deck features a narrow 46" out-to-out of main beams for additional loading versatility. 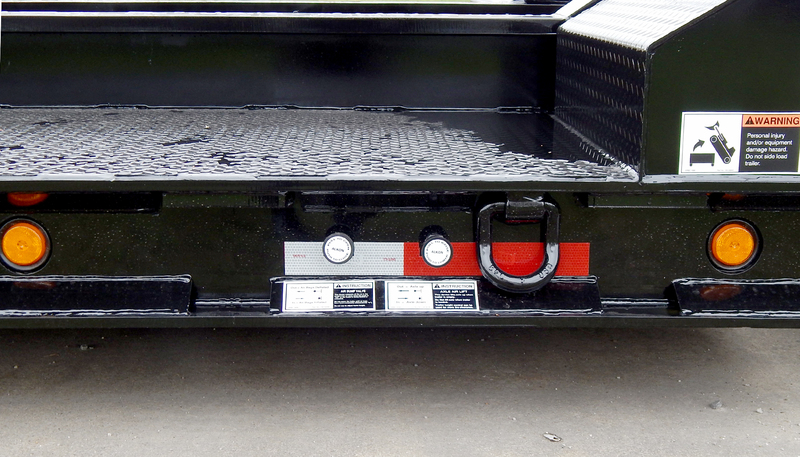 The "Bucket Pocket" is full depth with 1/2" high strength steel plate in lieu of lowered cross beams and has a 30" wide opening between the main beams. 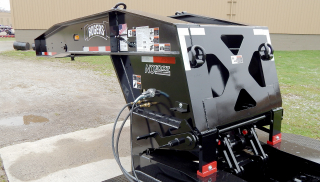 Air controls for the suspension dump valve as well as the 3rd axle air lift are conveniently located on the roadside beam at the rear of the drop side deck. 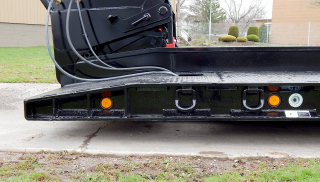 The "Boom Trough" for this trailer is constructed with special "V" style cross members providing an extremely low loading profile between the rear frame beams. 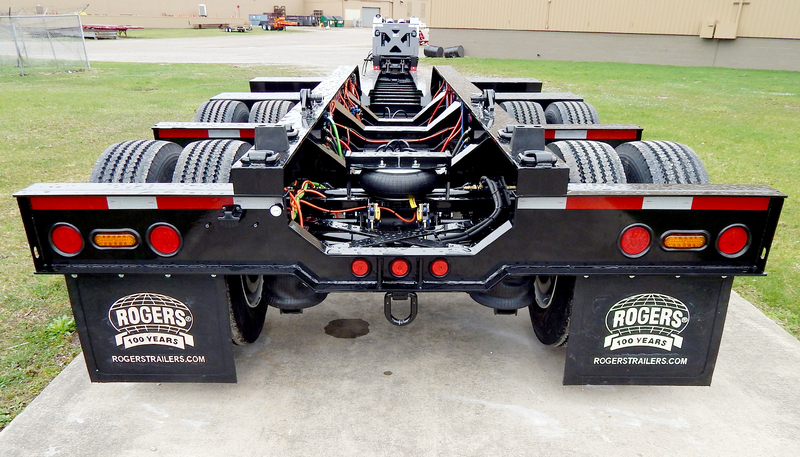 Wide trunnions between the tires provide additional load space on the trailer's rear frame. 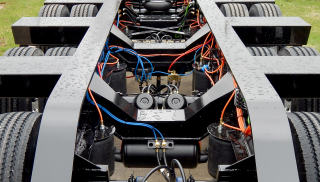 The 3rd and 4th axles are shown in the lifted position using the axle air lift on each. 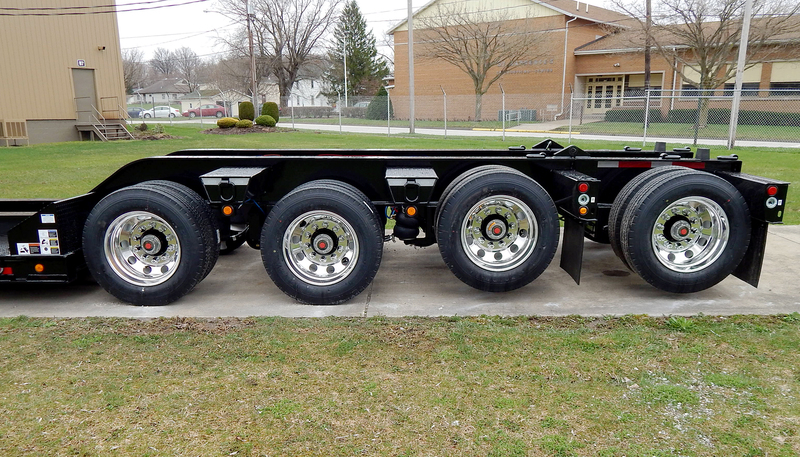 Polished aluminum disc wheels (outer only - steel inner) are optional equipment that reduces weight while enhancing the appearance of the trailer. Optional LED amber marker/clearance lights are mounted below each trunnion. The toggle switch for the optional LED oval amber strobe lights is located on the side of each rear channel - on the rear frame and on the removable/flip axle. A view from behind the trailer (including the removable/flip 4th axle) shows the lowered "V" style cross members which form the "Boom Trough". Strategically placed lashing D's to assist in the flipping or removing of the 4th axle assembly.